Happy Hotelier has resurrected and refined the new T-List, a list of travel websites and bloggers. 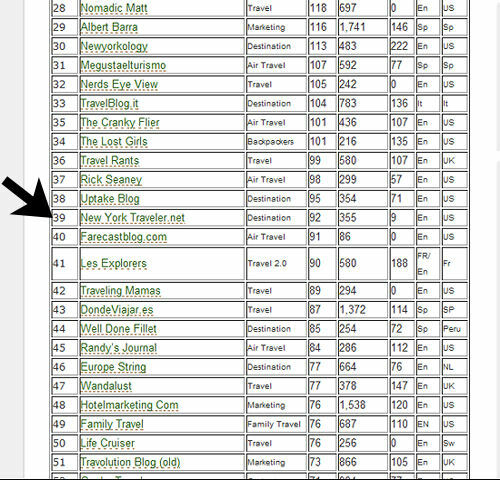 He’s organized and ranked 300 travel sites (wow!) by Technorati ranking. I was stunned to see this blog at #39! I am elated and very surprised! My blog is up there with the biggies like The Lost Girls, The Cranky Flier, NewYorkology, and Uptake (formerly Kango). I’m flipping with glee! The T-List first appeared over a year ago. It was an effort to network the great travel blogs and websites, to generate interest and importance. Happy Hotelier, a Dutchman who runs a terrific travel blog himself, has put enormous effort into maintaining the ranks. Kudos to you, HH!